Its metering works on pressure differential, as opposed to air velocity. Which means it self-adjusts its fuel to air ratio in order to accommodate any change in weather or altitude (barometric pressure). Also important to note, instead of a single main fuel discharge the Fish has multiple fuel discharge points (from six to ten). That pays big dividends in superior atomization. The more completely vaporized fuel exposes more molecules to oxygen so a larger percentage of the fuel burns, making more power. The payoff is an average of 20 percent better gas mileage and 30% more horsepower. In spite of the fact that the Fish Carburetor was simple in design, inexpensive to build and saved fuel. No big surprise, the invention was not eagerly received by the establishment. Suffice it to say the Fish carburetor was in its early days a suppressed invention. J. R. Fish endured many dirty tricks in the attempt to squash his carburetor business. In 1954 his mail was stopped by the U.S. Government. In the vintage photo above we see the Fish carburetor production line in Daytona Beach, Florida at about the time the U.S. Post Office was returning all Fish carburetor orders to the senders with FRAUDULENT boldly stamped across the front of the envelope. 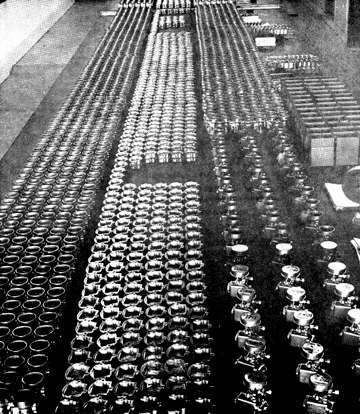 Incredibly the Post Office claimed there were no carburetors being produced. When in fact, from 1947 to 1959, the Fish Carburetor Company of Daytona, Florida manufactured more than 125,000 carburetors. The bogus charges were refuted in court. Also back then the Securities and Exchange Commission (SEC) hassled him with specious fraud charges. At about that same time as the US government harassment was going on a famous stock car driver named, Fireball Roberts, replaced the Detroit 4-barrel carburetor on his Buick Century race car with an M-1 Fish carburetor. Long story short, he left the competition eating his dust. During many races Fireball Roberts frequently made Pole Position and won the trophy. Then his tires began to develop mysterious problems. In 1955, Fireball Roberts drove his Fish-carburetor Buick in the Daytona 500 and beat three Chrysler supercharged 300s by a mile and a half. Roberts was disqualified with no reason given. Perhaps because with the Fish Carburetor's better fuel efficiency he needed fewer pit stops. Contemporary Holley and Rochester two- and four-barrel carburetors have many, many parts. 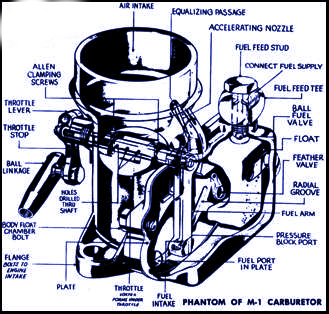 The Fish carburetor has only three moving parts and a total of 17 components. There are four systems in the Fish Carburetor. First is the progressive fuel metering groove in the bottom of the float chamber. It measures .0028 in width at idle gradually increasing to .078 at wide-open throttle. Its function is similar to the metering rods found in standard carburetor, but the groove is more precise. There's a needle valve adjustment at the top of the fuel pick-up arm. Similar to those found on old farm tractors, needle valve adjustment allows transitioning from gasoline to alcohol in about 90 seconds. A Fish also meters nitro methane, paint thinner, parts cleaner and kerosene. There are three air intakes in the top of the throttle shaft. Air mixes with fuel in the shaft and the mixture flows down the venturi tube with a vortex effect. Standard carburetors, at part throttle, inefficiently dump most of the fuel and air down one side of the throttle plate. To compensate a big engine would need multiple barrel carburetors and cross-over intake manifold plenums. Throttle valve angle is adjustable via an Allen Head screw for maximum cruising range efficiency. Air flow as well as fuel metering is adjustable. 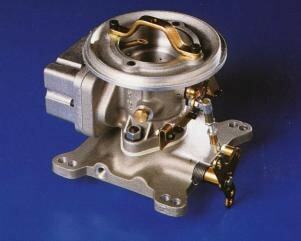 Important to note, one of the reasons for the carburetor's better fuel efficiency is the quality of manufacturing. 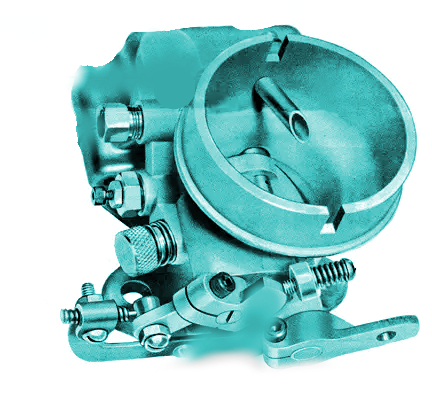 Conventional carburetors are thin wall castings prone to cracking when tightened-down snugly on an intake manifold creating a vacuum leak. Vintage fish carburetors and contemporary production models are robust and don't crack. The Fish carburetor competes well with electronic fuel injection because it automatically compensates for altitude and easily adjusts to burn alternative fuels. 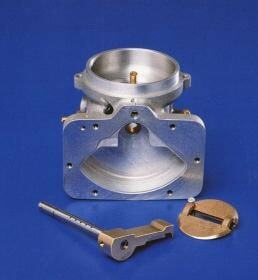 Since 1981 the Brown Carburetor Company has built more than 10,000 of the New Fish Carburetor. For more information contact the current manufacturer. View the Fish Carburetor Patent (Circa 1934).